This unit consists of an iron core-pulling machine and cuts the larger material into smaller material. The unit possesses a crushing head, which in turn consists of a shredding type unit capable of shredding up to five tons of material per hour. The system is a closed loop hydraulically driven system. The system works at very high pressure and therefore with small displacement develops a very high torque. 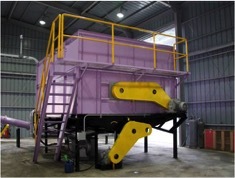 The feedstock is broken down into manageable sizes mechanically via the hopper unit. The Hopper consists of metal cutters and drums designed specifically to cut and mulch waste. The hopper can be pre-loaded and contains up to ten tonnes of MSW and other waste. 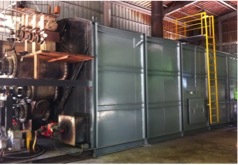 The Hopper uses a gravity fed system and a screw mechanism feeds the main pyrolysis unit automatically. Pyrolysis involves an endothermic reaction through general combustion. This is done by the generation of heat re-actioning the system that produces solid, liquid and gas by heating it at moderately high temperatures under no oxygen or low oxygen atmosphere. Pyrolysis is categorized into three major types (flash, fast and slow) and is based on temperature, rate and residence time. 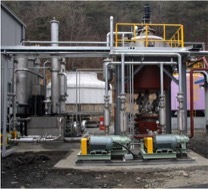 The pyrolysis system shown above is of modular design. 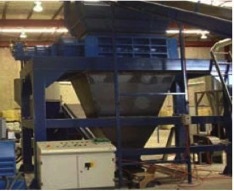 Each plant can process 20 to 24 tons of dry unsorted waste per day. The pyrolysis mechanisms hardly produce any greenhouse gases. However, acidic gases are likely to result and require removal. The Ion exchange wet scrubbing unit achieves the removal of acidic gases with a minimum use of chemicals by filtering the syn-gas using a bag filter and then cooling the exhaust to about 600C in a heat exchanger. The exhaust gas then passes through an acidic scrubber to remove hydrogen chloride and an alkali scrubber to remove sulphur dioxide. It is then reheated in the heat exchanger before being expelled by a large fan. 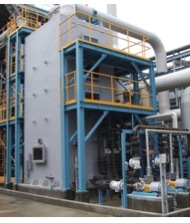 Most gasification processes cool the stn-gas to 600C for conventional gas scrubbing. However, this cooling results in significant energy losses. Using our technologies there is an efficiency advantage in cleaning hot gas and then burning it in a boiler or gas turbine. The syn-gas is filtered at 900C using sintered metal filters and then directly burnt in a turbine in our all electricity plant. By keeping the temperature at 900C, tar condensation is not a problem and the temperature is sufficient to remove alkali metal chlorides.